The transportation and storage of explosives is a daily occurrence for industries such as mining, construction, oil & gas and Pyrotechnics. According to the Canadian Department of Justice, the mismanagement of these assets can include penalties as severe as imprisonment for life. The SkyHawk Explosives Monitoring System is a rugged, compact, reliable, and cost effective mobile monitoring system for dangerous goods. 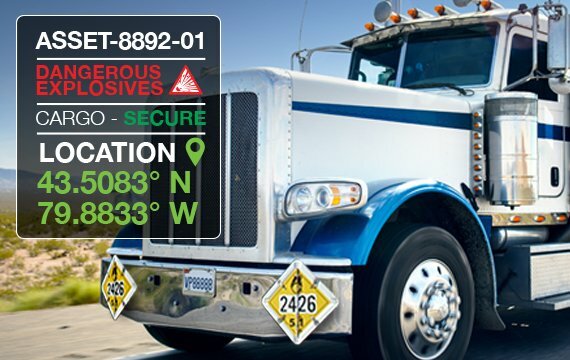 Designed specifically for the monitoring of explosive transport vehicles, wireline trucks, railers and mobile cargo containers, the SkyHawk Explosives Monitoring System provides instant notification of unauthorized equipment access. The Federally approved monitoring system sends alerts of any access attempts or security breaches directly to your computer or mobile device, while logging data for future review. The SkyHawk Explosives Monitoring System provides your company the regulatory compliance required to maintain explosive transportation permits.